On January 18, Defence Minister Nirmala Sitharaman announced that search and rescue operations for fisherfolk in the aftermath of Cyclone Ockhi that struck southern India had been called off. “Since there was no result for seven to eight days, the search operation was called off on December 27,” she told reporters. Between November 30 and December 4 last year, powerful winds and heavy rains brought on by the cyclone had left 93 people dead and damaged over 10,000 homes. The defence minister’s statement came around 50 days after the powerful cyclone left a trail of destruction across south India. At the time of the withdrawal of operations, over 660 fisherfolk from Kerala, Tamil Nadu and Lakshadweep were reported missing. The magnitude of destruction places Ockhi among the worst cyclones to have struck the Indian coastline in the last 50 years. Immediately after the cyclone, questions were raised about the delay in forecasts issued by the government and the lack of preparedness to deal with the cyclone. The first intimation about the possible formation of a depression from the India Meteorological Department (IMD) came on November 28 in the Tropical Weather Outlook issued at noon that day. By November 30, rather than a depression, a cyclonic storm was ravaging the southern tips of Kerala and Tamil Nadu. Ironically, in recent years, IMD has been successful in warning about the possible development of depressions into impending cyclones five to six days in advance, which helped in limiting damage and casualties. Certainly, this was the case with cyclones Phailin in 2013, Hudhud in 2014 or Vardah in 2016. So why was Ockhi different? For one, Ockhi’s track, or path taken by the cyclone, was a very unusual one. It isn’t common for cyclones to strike the west coast of the country. Usually, it is the warmer waters of the Bay of Bengal (BOB) that fuels storms which strike the east coast of the country. But unlike a typical cyclone, Ockhi did not evolve in the Andaman Sea or the eastern BOB. Rather, the low pressure area that went on to become a very severe cyclonic storm developed near the southeastern coast of Sri Lanka’s teardrop, in southwest BOB on the morning of November 28. After concentrating into a depression by the next morning, it began moving northwestwards in its long 2,538-km journey and struck the Indian peninsular tip on November 30. There are only three instances of such a path being taken by any cyclone on record. The last time a track like this was witnessed was in 1925. “This is a very unusual path taken by the cyclone. There have been some instances in the past when cyclones had developed on BOB and made their way to the west coast but these usually travel over the peninsula. Only a few have been recorded where the path has been completely over water,” says M Mohapatra, head of the Regional Specialised Meteorological Centre (RSMC) at IMD. The surprises didn’t end there. After striking Lakshadweep, the system did not continue on its path northwestwards, but rather recurved towards India’s west coast. While this is not unprecedented, it is very uncommon. One has to go back beyond a century to find the last known example of such movement by a cyclonic system. According to IMD, a severe cyclonic storm in 1912 took an almost identical route from Sri Lanka to the coast of Maharashtra. The cyclone’s strength and its fast evolution too took scientists by surprise. At its peak, winds up to 180 kmph were lashing Lakshadweep. But more alarming than that was the rate at which it developed. Within 9 hours between November 29 and 30, the system jumped from being a depression to an organised cyclonic storm. “We witnessed a rapid intensification of the storm in the first 24 hours of the cyclone, it intensified from a deep depression to a cyclonic storm in under 6 hours (It normally takes two days). This was primarily due to ocean heating near the Coromin area, west of Sri Lanka. In addition, the air was rich in moisture and the upper tropospheric conditions allowed for a vertical movement of air. 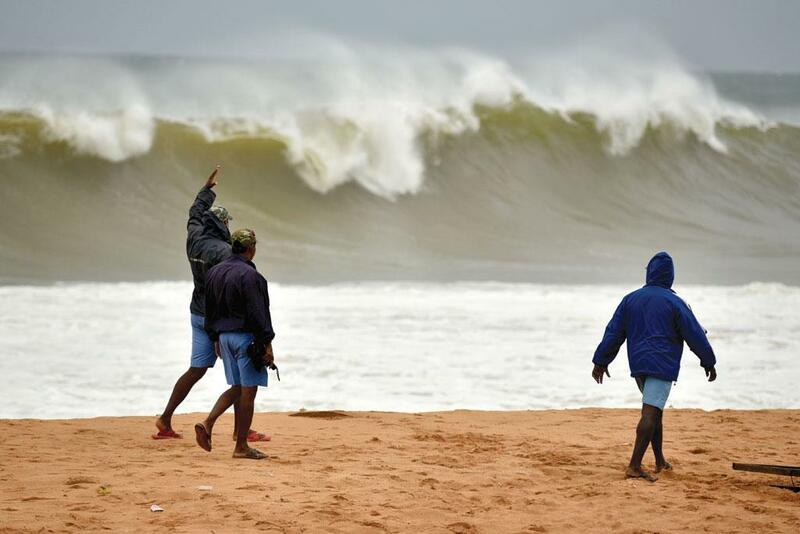 All favourable conditions for the ocean heat to power a raging cyclone like we saw,” says Mohapatra. The same thing happened again the next day as it made its way towards Lakshadweep and concentrated into a severe cyclonic storm in less than 15 hours. In all, the system evolved from being a depression to a very severe cyclone in less than 40 hours, instead of the normal period of about 72 hours. Effectively, IMD could not issue advance warnings like in other cases because there was no time. This was especially critical for fisherfolk, many of whom spend days in the open seas. By the time the cyclone called it quits on the Gujarat coast, it had been on the move for nearly seven days, 43 per cent longer than an average cyclone in this region. While Ockhi in itself came as a surprise, the fact that it happened at all shouldn’t come as a surprise. In the past decade, an increasing number of studies have suggested that a rise in sea surface temperature (SST) across the Arabian Sea is likely to cause the usually calm waters to become rougher. A greater number of storms and cyclones have been predicted in the region. In fact, as recently as in November last year researchers from Princeton University and the National Oceanic and Atmospheric Administration in the US published a paper in Nature Climate Change claiming they had proof that global warming was linked to cyclonic activity in the Arabian Sea. The researchers generated modelled simulations for two separate conditions to predict cyclonic storm activity in the Arabian Sea. Models run on values of 2015 matched the recent observed cyclonic activity and the researchers believe that as SSTs continue to increase, the intensity and frequency of the cyclonic storms will also rise. So far, only preliminary analysis of the cyclone has been completed and a more detailed analysis of what led to the freak movement is awaited. But how this is incorporated into forecasting models is another matter altogether. The recently acquired Pratyush petaflops supercomputer by the Indian Institute of Tropical Meteorology, Pune, might be a useful addition in this regard. Mohapatra says that all efforts will be geared towards examining the cyclone more rigorously and incorporating the findings into forecasting models so IMD and government administrations are not caught off guard again. “In this regard, Prayush might indeed be very useful, but there is a lot of work that needs to be done,” he adds. (This story was first published in the 1-15th February issue of Down To Earth under the headline, 'Understanding an unusual cyclone'). An article on Cyclone Ockhi indicates the frivolous approach by Down to Earth magazine in analysing the reasons behind the disaster with considerable magnitude. It is superficial and just a copy paste of the reports appeared in some news papers in December. It tries to mask the deficiency of IMD in forecasting the track and severity of the cyclone by mentioning that there was no precedence for such a phenomenon earlier and the depression suddenly developed into a cyclone. Down to Earth tend to forget that Weathermen are employed to keep a vigil on the parameters, when anomalous, lead to severe weather phenomenon. The complacency of IMD and the deficiency of its models for weather, cyclone and monsoon forecasting is known to all now. The credibility of the magazine is in question.